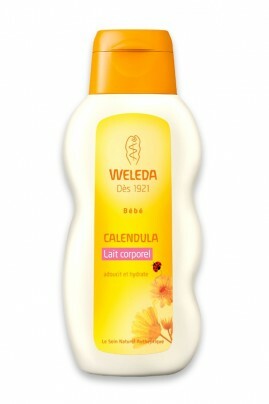 Weleda Calendula Baby Lotion gently nourishes your baby’s delicate skin. This light, nourishing all natural baby lotion provides long-lasting protection from environmental drying influences. Particularly good for use after baby’s regular bath, Calendula Lotion leaves your loved-one glowing with soft, supple, moisturized skin. Weleda Calendula Lotion contains Biodynamic and organic calendula flower extract that soothes skin inflammation and wraps your child in a nurturing layer of warmth, like a loving hug. A light base of sweet almond oil ensures easy absorption of this moisture-rich all natural lotion, while beeswax smoothes your baby’s skin and protects from dryness. You may be constantly replacing outgrown clothes, but with Weleda Calendula Baby Lotion there will always be cuddly comfort in your baby’s soft, beautiful skin. After a bath, apply Weleda Calendula Baby Lotion to your baby’s entire body and gently massage in. The lotion will absorb quickly into your baby’s skin.